Aquaponics’ Grow Tables raise healthy, fresh table vegetables. Portable Farms® Grow Tables never overflow and are now fully automatic. 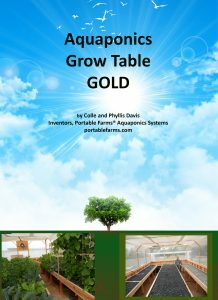 Aquaponics Grow Tables GOLD ebook – US$59.95: CLICK HERE FOR MORE INFORMATION – The sale of this ebook does NOT include the Automatic Trip Valve (ATV) that regulates the water level in the grow tables, but the ATV is available with the purchase of this book for an additional US$20.00 in offer below. Aquaponics Grow Tables GOLD ebook and Automatic Trip Valve – US$79.95: CLICK HERE FOR MORE INFORMATION. This sale includes the ebook and the Automatic Trip Valve (ATV) that regulates the water level in the grow tables. The shipping for the ATV is free within the US. The shipping for the ATV is US$12.95 outside the US. You will be contacted to pay shipping charges prior to shipping. Portable Farms® Grow Tables become more valuable over time because their production increases over the first two years after the operator learns what plants they enjoy growing. The valuable content in this Aquaponics Grow Table GOLD ebook has emerged from more than ten years of success in the marketplace. We have continued to refine our Portable Farms® Aquaponics Systems and are now growing food in twenty-five countries and in all fifty US States. The design and function of our Grow Tables incorporates our experiences, the feedback from our global customers, engineers, universities and from many of our own odd mistakes and failures. The true success of an aquaponics system allows its operators to take a weekend off occasionally, and never worry have about watering or feeding the plants to grow delicious, healthy and pesticide-free food. Here are the many benefits of the Portable Farms® Grow Tables. They do not leak if constructed properly. They do not bulge or distort when full of food. They have adjustable legs to level them on uneven surfaces or for special needs (such as building them to be wheel chair accessible). The tray depth and water flow can be modified for growing kitchen or medicinal herbs. The grow trays can be flooded if insect control is required. 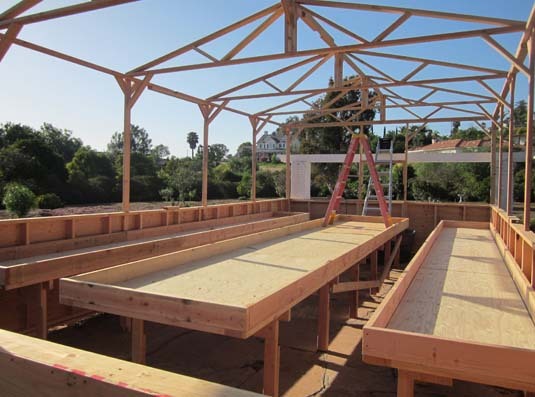 Each grow table can be sized in width and length to accommodate your location or the food for family or group needs. The grow tables are easy to keep clean. The crushed gravel in the grow tables never needs to be cleaned [if you use a clarifier]. The plants in the grow tables strip out the nutrients as the water flows through the crushed gravel. As the water flows through the grow tables, it becomes re-oxygenated during each cycle before it returns to the fish tank adding to the health of the fish and fish tank. Crushed gravel, the least expensive substrate is used to grow the plants. Think cheap and local. Growing food from the waist high grow tables makes it easy to plant, care for the plants and harvest the food. Measure the space you have and use the formulas provided and the near future the world of self-reliance starts. PLEASE NOTE: A competent carpenter can build the entire grow table in about 6 hours. We make the assumption that whoever is constructing the grow table has several years of construction experience using power tools, hand tools, and common building materials. Even though the construction is very straightforward and uses common building materials, a high level of precision finish work is required for the grow table to function correctly. A hobbyist without construction experience is very seldom capable of building this level of precision without some excellent help and support.